Planning to visit one of our partners anytime this week? 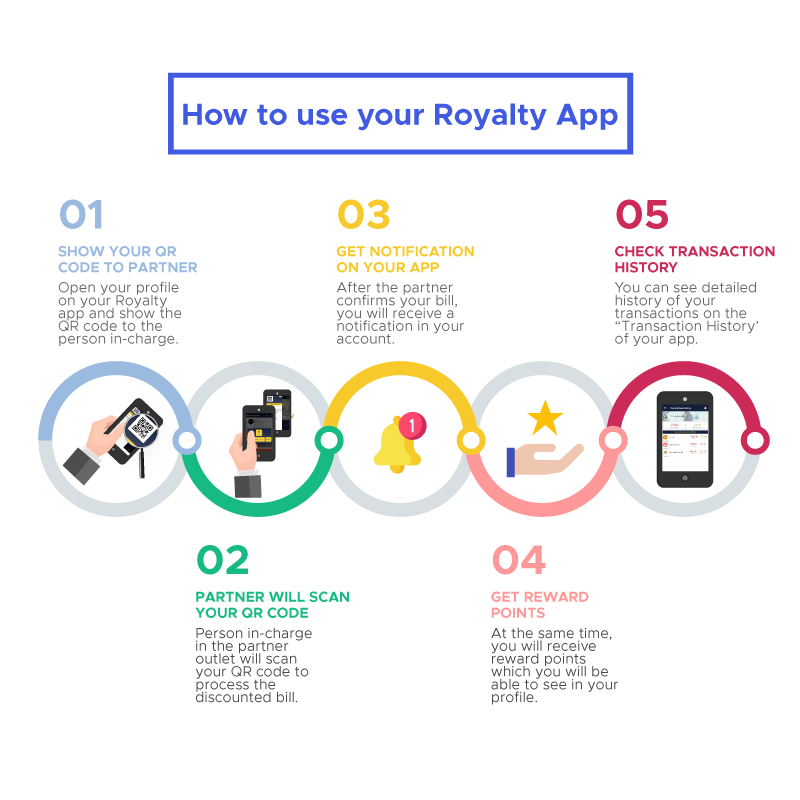 Not sure how the Royalty card works in real life? Check our 6 different categories to know more about the privileges and details before you plan a visit. The process to Get the best out of your card is easier than you think! Just follow below. Once you are at our partner’s outlet, during the bill processing, take out your Royalty card and hand it to the cashier. The cashier will process the discount on their checkout app by scanning your QR code. You will get a notification on your account regarding the transaction. At the same time points will be added to your account. Once you are at our partner’s outlet, during the bill processing; take out our Royalty BD App, you will find your virtual app, swipe the card to find the QR code. Once the partner processes the discount on their checkout app by scanning your QR code, you will get a notification on your phone regarding the transaction. Just remember to make sure you have your point+transaction history* updated after the discount before walking out of the partner’s outlet. In case you have any queries, feel free to contact us at support@royaltybd.com or call us at 09638620202. We’re here for you Saturday through Thursday from 11 a.m. until 6 p.m.
You can even reach out to us on Facebook.